At Pine Grove the cottages are nestled in tall evergreens and are well spaced for privacy. We offer superb, well-maintained accommodation. 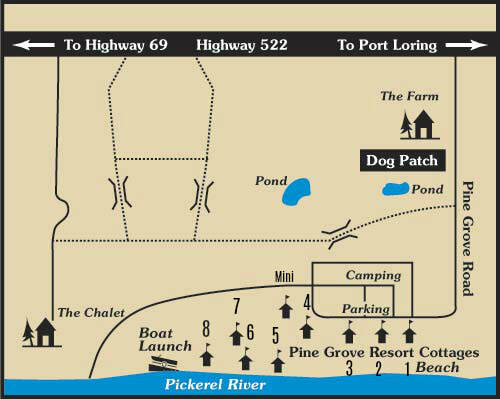 The Pickerel River and our sand beach are steps from the doorway of your private cabin. We offer 8, two and three bedroom waterfront cottages that are open from May- November. We also offer a mini couples cabin, private luxury chalet, and Farmhouse. For more information on cottage pricing, please visit our Rates page.